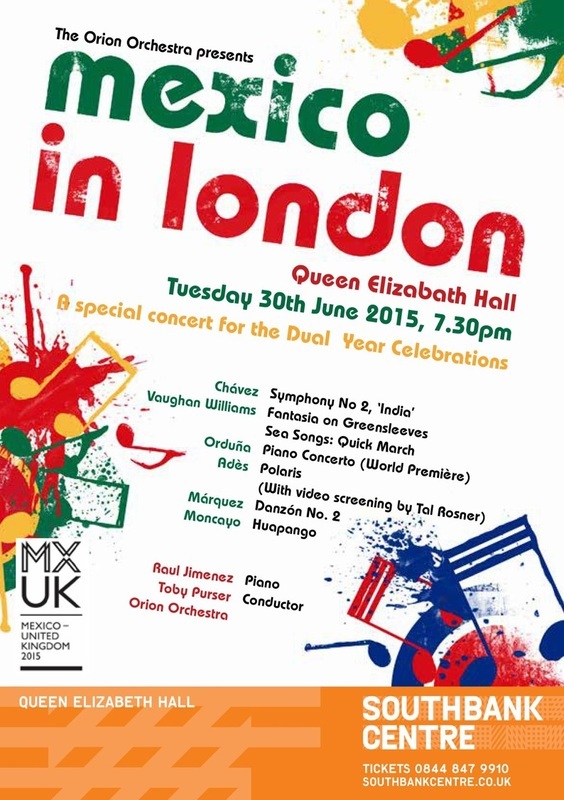 Scheduled to celebrate ‘2015 the Year of Mexico in the UK’, the Orion Orchestra is holding a Concert inspired by the Dual Year celebrations. The concert will be held in the presence of His Excellency the Mexican Ambassador to UK at the Queen Elizabeth Hall on 30th June 2015. Showcasing the Orion Orchestra’s exceptional energy and virtuosity, the thrilling programme celebrates the cultural richness of both nations’ classical music, bringing together some of the most famous works from both cultures (eg. MárquezDanzón No.2, Mancayo Huapango. and Vaughan Williams Greensleeves) as well as new works by some of their most important living composers. The highlight will be the World Première of Mexican composer Federico Gonzalez Orduño’s new piano concerto, performed by Raul Jimenez, the composer’s dedicatee, and conducted by Toby Purser, Artistic Director and Conductor of the Orion Orchestra. More than just a musical performance, the concert will be a visual as well as an aural experience: British composer Thomas Adès’ Polaris will be performed simultaneously with video projections on three large screens above the orchestra, designed by BAFTA-award winning artist Tal Rosner specifically for the work. This initiative offers an opportunity for the public to recognise the musical achievements of our two countries, and encourages the development of closer cultural and business ties between them. Book your tickets now, click here.